This will be a rap battle, obviously. I will be rapping as Hitler, meaning you will be Stalin. The first round is for acceptance, I will post my first rap in the second round. Than we continue rap battling until the debate is over. -No vulgarity (Yes I know most raps contain this but we all can be mature here). -You must stay in character. -Your raps must be in English. You may have occasional words in your language (yours is Russian, mine is German) to add some rhyme, but English must be the most dominant language in your raps. -Raps cannot be longer than 25 lines (if you would like to change this, comment and we can discuss changing). -Your first rap (which will be in the second round) will be you introducing yourself, saying how slick your rhyme is, how cool you are, etc. So I'm Hitler, you're Stalin. Good luck. that the real battle here won't be quite so touching. When Old Joe drags you back to the U.S.S.R.
You can't beat me at any cost. we were both ones to kill our own people. you're a disgrace to the perfect German race. because your skills are just meager. Now go back to your cave, you ignorant punk. The command of your army makes you seem like you're drunk. My mustache brings me cash, your's just brings a rash. Without your allied powers, you'd immediately crash. With the thought of me, your whole army shook. As long as I'm around, you can't get any crueler. And with skills like these, you'll never be the winner. (1) sieger is the German word for winner. (2) Mein Kampf was a book by Hitler. It means, "My Struggle." (3) Zweites Buch was also a book by Hitler. It means, "Second Book". I know, such an excellent book title. (4) Fuhrer is the German word for leader or commander. (5) Ich bin ein Berliner translates in English to "I am a Berliner". A Berliner is a person from or somehow involved with Berlin, Germany. (6) Frieden is the German word for peace. You know, like how rappers say "peace" when they're done. The ranks of my men Ideologically pure. "Stalin" is nickname that derives from the Russian word for "steel"
How dare you insult the Nazi pride! And how dare you denounce my only bride! I beat the Poles and Czechs, guess who's next? I'll carve my name into your communist necks! You brought your's to shame. Before I set Russia aflame. The Axis will have one Holle (1) of a reunion! Welcome to Deutschland, (2) where I rule with an iron hand! When I'm done with you, you won't be able to stand! You call yourself the man of steel? You'd be better off if you would kneel! Can you fit nothing else in your Dummkopf (3) can? You call me a snowball, you'll get a blizzard! An avalanche! I'm so slick, you'll kacken (4) your pants! We'll make you bow down to the German Empire! I'm kickin' this rap into full throttle. (1) Holle is the German word for Hell. And no, that doesn't count as vulgarity, it's just a place. (2) Deutschland is German for Germany. (3) Dummkopf is German for fool. (4) Kacken is German for poop. (5) Hamburg is a city in Germany. (6) Brandenburg is also a city in Germany. (7) Luxembourg is a neighboring country to Germany that was occupied by Germany during WWII. (8) Trottel is German for idiot. (9) Again, Frieden means peace. The world watched you fall on the tip of my spear. The fallout erasing all trace of the Nazi. Weak men steal others lines cause their own are lame. But saying it twice doesn't count as a rhyme. I"ll do you a favor and clean your brains off your floor. Say my name punk - IT'S STALIN. I'm slick, I'm cold, I like things frozen! You'll be squashed by the man the people have chosen! I'm sweet with my rhymes, quick with my wits. Nazi ideologies even spread to America! Why should I obey the man who can't even spell "Kamikaze"? All you got is haters, I've got a paparazzi. How about we meet in Berlin, say Friday night? And could put up a fight. Come on Stalin, I'll show you to your grave. Or would you rather me take Russia, and make it my slave? Nazi Deutschland is starting a rave! Why don't we see who has the stronger empire? You could be beaten by a mere church choir. Before my Soldaten (2) hang you on a wire! Which is exactly what I'll do to you! (1) Auschwitz was a concentration camp. (2) Soldaten is German for soldiers. to crush you like an egg. Or do us one better- stick your face in a blender. Why don't you just say "Hitler"? Right now, nothing of yours could get any littler. I've got Mussolini, Hirohito, boy am I glad. I got more than one Axis comrade. H-Bomb, does that "H" mean "Hitler"? We certainly are the bombs, even Mr. Himmler. You crush me like an egg, I'll fold you like origami. Get ready to be a swan, you arrogant commie. Just for now, don't be a meanie. This guy, he's slick like a genie. 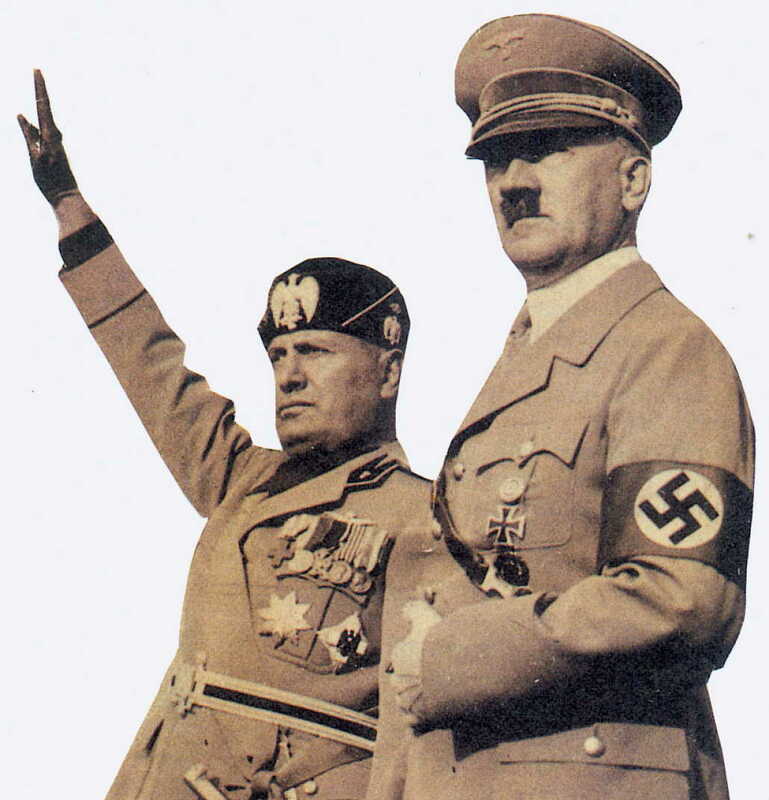 Put your hands together for my pal Mussolini! Italy's got more than pizza and linguine. They've got me, Boss Mussolini! And we'll knock you from London to Rome. We'll beat you down, then read you your rights. 'Cause when you taunt Italy, you stare into a gun. By the time we catch up, you'll already be done! (1) a reference to the attacks on Pearl Harbor. (2) "piu tardi, perdenti!" Is Italian for "later, losers!" The Nazi flag in tatters. Trying to bend what will not yield. "Lost the battle, not the war"
This all ends with the Soviet victor. This is an EPIC rap battle! I can't vote either way as both would be a tie in my mind. Great stuff!! Strong debate. I liked the idea of rap-debating. Keep going. Good luck. Obama is not a paranoid person. If he would, the USA would be in really bad shape. This historian talks about the reason Hitler lost WWII and that reason is that Hitler was because Hitler put his ideology in front of his country and the army. Oh, so it's okay to kill people because you're paranoid about them? That's like Obama going into a Congress meeting and shooting every Republican in the room. Its one thing to believe in doing good for a country. A complete different thing to actually DO good for a country. And Stalin also believed he was doing good for His country, its just that he believed that all those people he killed were getting in the way of him doing good which is why he killed many people. Stalin also killed people because he was constantly worried about people betraying/working against him, in other words he was paranoid. Hitler killed people simply because he did not like them since he thought the Germans were the "master race". Because he did good for his country and actually believed what he was doing was for the greater good. Stalin killed his own people just to have the power. Yes, but why did you say that Hitler > Stalin? Bro, this is the THIRD time I've said that Hitler was a terrible person. My goodness. Hitler is also a terrible person, even more terrible than Stalin was. He is considered to be the most evil dictator in history. I don't. I just said he was a terrible person. Reasons for voting decision: Although I would have liked to vote for Con, Pro definitely has a stronger side. He uses words in German which is a bonus for him. That is the main reason I vote Pro. Reasons for voting decision: So save us the trouble, by now you're just stalling Say the name of the man before whom you"ve just fallen It"s the same name you can hear the whole audience calling Say my name punk - IT'S STALIN. that won the battle for me. I loled for a few minutes, and it reminded me of 8 mile for some reason Sources to pro because he actually did a full round full on translations. Reasons for voting decision: Con struck from both sides, and his rhymes hit hard. Pro mostly followed his lead, always behind by a yard. I almost want to give Pro sources for all the citations Was this a rap battle, or 101 history of nations? Reasons for voting decision: Good job all around. Pro very nearly came in ahead with those nice translations (evidence category, so sources is what I would have awarded), however I can't get the information about Hitler and Poop out of my head. Therefore I'm having to cast a null vote, as both were fantastic!